After a few days of hacking, "rfk.id.au" now acts as an Identity Provider for the BrowserID protocol, a.k.a Mozilla Persona. 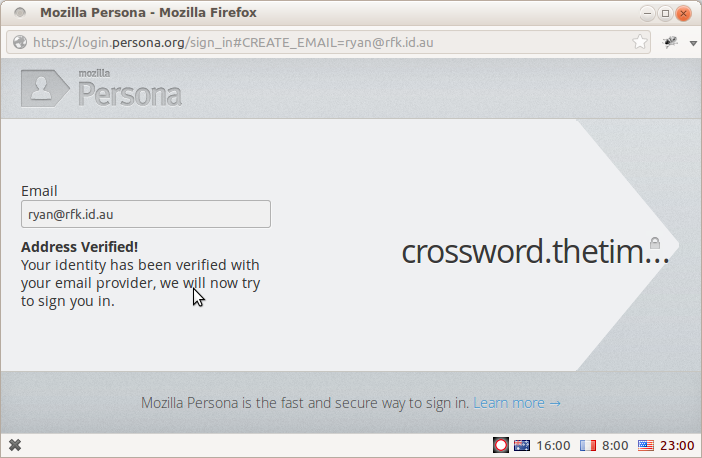 This means I can now log in as ryan@rfk.id.au on any persona-enabled website while retaining complete control over my identity. I do not have to delegate my details or my credentials to a third party, even one that I would trust as much as Mozilla. Here's the BrowserID support document to prove it. My setup has some peculiarities, but it's not terribly different to what an email hosting company might construct to provide Identity Provider services for its users. In this post I will explain the new capabilities that this setup now gives me, and show some of the technical details of the implementation. 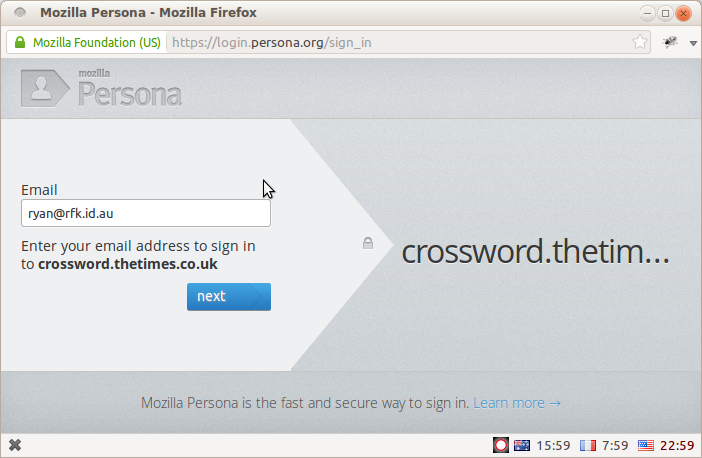 Suppose I visit a persona-enabled site like The Times Crossword and log in using Persona. Here's what I will see, and a high-level description of what will happen behind the scenes. A full definition of the BrowserID protocol and related terminology is available at the id-specs page on github. When I click next, this dialog will check whether my email domain provides native support for the BrowserID protocol. It attempts to load a "BrowserID Support Document" from https://rfk.id.au/.well-known/browserid, and since I have just set one up this request will succeed. A link to an "authentication page". This page will be responsible for prompting me for my password and establishing an authenticated login session to my domain. A link to a "provisioning" page". This page will be responsible for producing an "Identity Certificate" signed using a cryptographic private key known only to my domain. A cryptographic public key. This key can be used by anyone to verify identity certificates issued by my domain. Clearly I have not put a lot of work into prettying this up, but that's not really the point. The key point is that the authentication page is hosted on my own domain and I have complete control over it. The browser's strong cross-domain security model means that when I enter my password on this page, I can be safe in the knowledge that it will not be leaked to some third-party service. (Although there is one slight, temporary caveat to this bold claim, which I'll discuss below). Once I enter my password, the page stores some login session data in the browser and executes a callback to inform the Persona dialog that I have been successfully authenticated. Again, note that this page is hosted entirely on my own domain and is completely under my control. No details of the private key or login session can be leaked to third-party services. The target site will validate my identity assertion by following the chain of cryptographic signatures back up to the public key that I have published for my domain. I can login by entering my password on a site that I control. Neither the target website site nor Mozilla ever need to be trusted with my credentials. This is an important level of control over my security. The target website can verify my credentials by retrieving the public key directly from my domain. It does not need to pass my details to Mozilla or to any other third-party site, depriving them of an opportunity to track my activities online. This is an important level of control over my privacy. However, I must note that there are two temporary caveats to the above, due to Persona still being under heavy development. 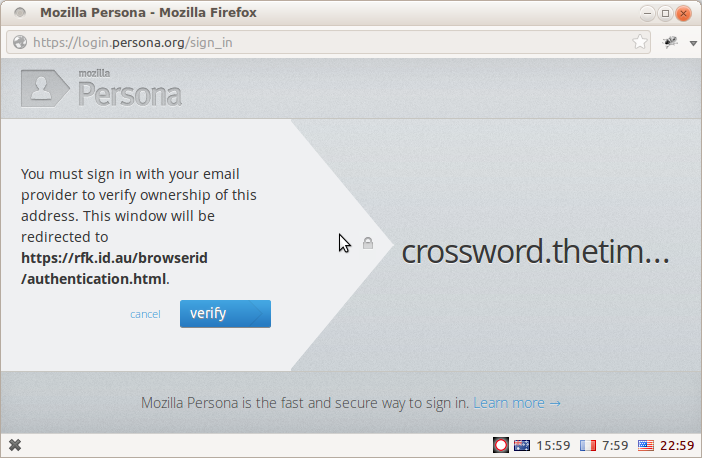 First, most persona-enabled sites verify identity assertions by POSTing them to a Mozilla-hosted service. If Mozilla were so inclined, they could use this data to track my browsing habits. But once the data formats for the BrowserID protocol have stabilised, it will make both moral and economic sense for sites to verify assertions locally and avoid leaking details of my browsing habits. All in all, I am very happy with the result. The Persona developer docs have a very good introduction to Implementing an Identity Provider, so I will not repeat all the details here. Instead I will highlight some of the key aspects of my implementation. The security of the BrowserID protocol depends heavily on SSL to authenticate each Identity Provider. Without it, anyone could set up a spoof "rfk.id.au" site and claim to be providing persona support with their own set of keys. Being a simple personal website, I had never bothered to set up SSL for this domain, and I was worried that the expense of doing so might make this whole endeavour a non-starter. Fortunately it is possible to obtain free personal SSL certificates from StartCom without too much hassle. These certificates are accepted without complaint by all major browsers and by the persona.org verifier service. Here's where things get tricky: there is no server-side code behind this website. I've come up with a solution which I think should be secure enough for my purposes. If any security gurus want to show me how wrong I am, I'm all ears. If you take another peek at my BrowserID support document, you'll see it has an additional field called "encrypted-private-key". That's the private key data, encrypted with a passphrase known only to me. When I visit the authentication page it will prompt for my passphrase, use it to decrypt the private key data, then store it in the browser's sessionStorage object. When I visit the provisioning page it will read the decrypted private key data from sessionStorage and use it to sign the necessary certificates. Anyone who can read my sessionStorage data could steal the decrypted private key. The browser should protect me here, since sessionStorage comes with a strong same-origin security policy and is purged when the login dialog closes. But bugs do happen. (Thanks to François Marier for suggesting that sessionStorage would be safer than cookies for this data). 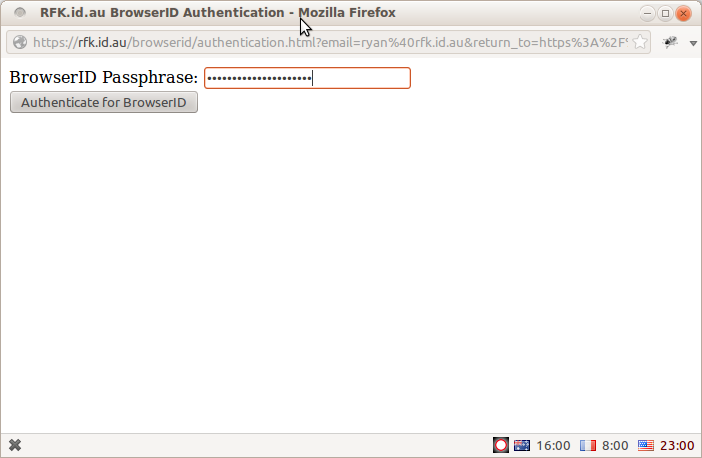 Anyone who knows my passphrase can authenticate with any address on the "rfk.id.au" domain. Since I'm the only one who knows it, and the only person with addresses on that domain, this is an acceptable compromise. Obviously it wouldn't work out so well for domains with multiple users. To emphasise: a real multi-user setup would generate certificates by making an authenticated HTTP request, so that the private key never has to leave the server. If I had any custom server code running already, I would do the certificate signing on the server. If you have custom server code running already, then you should do the certificate signing on the server. The above is, frankly, a hack so that I can avoid the need to sysadmin anything. It's possible that I will live to regret my Engineering Hubris.